Early 19th-century missionaries brought spinning wheels with them to New Zealand. In some rural areas, and particularly in Scandinavian settlements such as Norsewood, the craft was a part of daily life. Over time its importance declined until the war years, particularly the Second World War, when spinners were in demand to produce yarn used to knit garments for New Zealand servicemen fighting overseas. 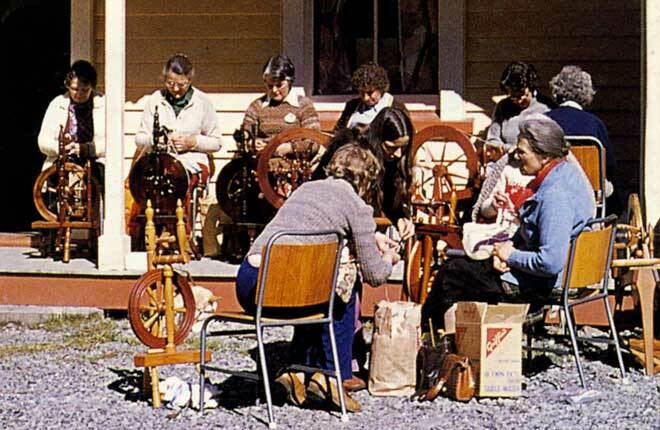 Women continued spinning after the war ended and spinning and weaving groups were formed throughout the country. This is a spinning group from the Arthur’s Pass area in 1979, led by teacher Margaret Stove (centre front, with her back to the camera). The sociable nature of spinning is clear.